Hypnosis, among all alternative therapies, may be the most dubious, the most debunked. Aside from snake oil few other therapies have figured so prominently in carnivals and side-shows. But there's a growing body of evidence that hypnosis actually works. It can, for example, reduce operative pain and anxiety. Now comes direct evidence that hypnosis can change patterns of brain activity. To start the experiment, subjects saw the colored pattern, allowing the researchers to identify which part of their brain became active in response to color but not, say, to the sharp edges in the image. Brains of hypnotized people were more active when they looked at the gray-scale picture -- than when they were told to see color. After a series of tests, the researchers found that the hypnotized brain's color circuitry was working overtime as it altered visual input from the eyes. Spiegel, who has also looked at how social support affects breast cancer survival,, says the finding helps identify the true nature of hypnosis. "There's been an argument in the hypnosis community -- is it just a heightened form of social compliance?" Probably not, he says: Hypnotized subjects who looked at a black-and-white pattern "were acting as if they were literally seeing color" when asked to see it in color. When subjects were asked to see a color image in black-and-white, Spiegel says, "They were not just telling us they saw it in black-and- white. Their brains are responding as if they were looking at black-and-white." The finding builds on the notion that simple imagining will "engage two-thirds of the same brain areas as in perception when you are actually visualizing," Kosslyn says. "If you imagine yourself practicing playing golf, you get better. The imagery stands in for the actual practice." 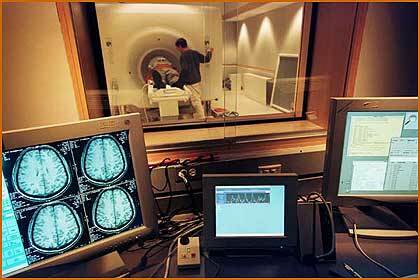 This PET scanner can find active areas of the brain by seeing signals from a radioactive tracer injected into the subject. Brain activity indicates that hypnosis can change brain function. Jeff Miller, (c) UW-Madison University Communications. The new study, however, also found an area in the left hemisphere that did not respond to such imagining. When hypnotized subjects were asked to add color to the black-and-white picture, this area became more active -- but not when non-hypnotized subjects imagined adding color. This is where hypnosis takes place. Courtesy: Jeff Miller,© UW-Madison University Communications. "So hypnosis does recruit more brain areas, it's like giving the brain imagery vitamins," Kosslyn says. The study (see "Hypnotic Visual Alteration... " in the bibliography) could have practical applications in alternative medicine, Kosslyn adds. "The key idea is something I call the reality simulation principle. Given that two-thirds of the brain circuits are the same in perception and imagery, imagery can mimic what happens in perception. Certain environments make you heal faster, like a hospital room with a nice view. Can you imagine a nice view? According to this principle, if images can stand for real things, that should hasten healing." While that idea is being tested, consider something that may work too well. Could St. John's wort kill you?